It is always a good bet that you will request something deep fried for your birthday (beignets, cannoli). N did not want to make your first request Chicken Fried Steak (though he did a year ago and the year before that) and denied you! How rude. 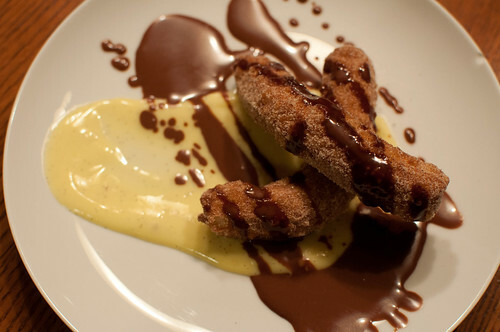 Undaunted, you requested Boston Cream Churros like the ones S had (here). I decided I would make them. How hard can they be? But first we had to figure out dinner. 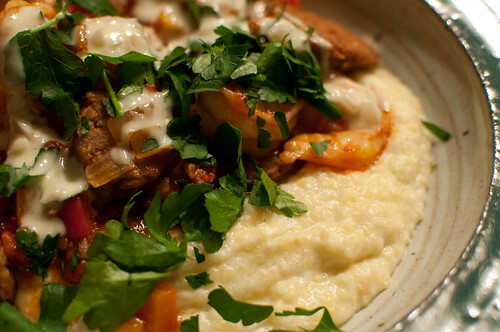 We considered Thai before finally deciding on shrimp + grits. Rather than making my usual shrimp creole, I loosely followed this recipe from Bon Appétit. It included a hot sauce made from green pepper hot sauce (I used Green Jalapeño Sauce by Tabasco), shallots, white wine, vinegar, lemon juice and cream. I complained to N that we needed a light green salad to go along with the shrimp, andouille, and grits. 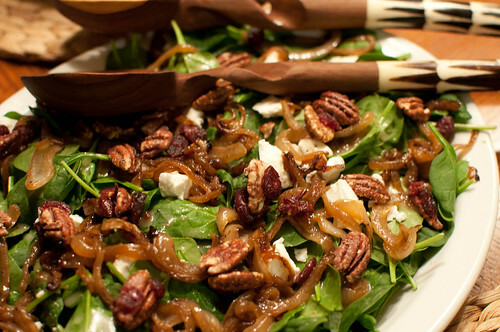 He came up with this spinach, caramelized onion, goat cheese, and candied pecan salad. Sorry about the dried cranberries in the pecans (held aside). We took a short break to clean up and then I started heating up the oil for the churros. I followed this churros recipe. 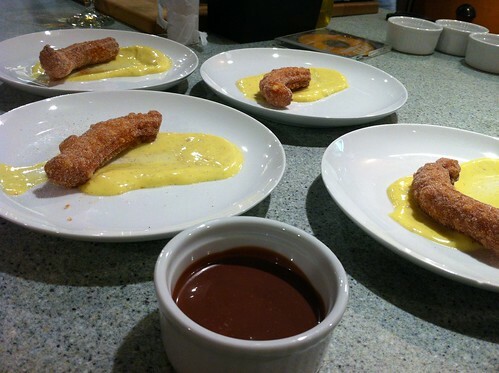 I had no idea churros dough is just like pâte à choux dough! Boil water and butter, add flour, then add eggs individually and mix until smooth. Fun dough! 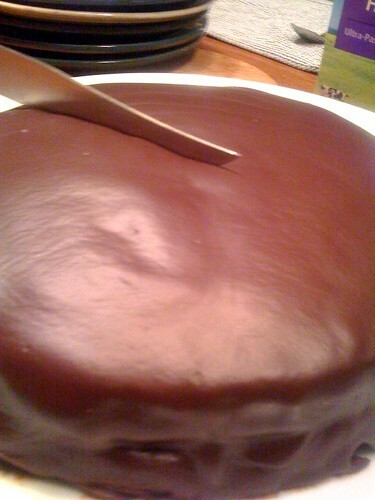 I read a lot about the filling in Boston Cream Pie while researching. Some recipes used vanilla pudding. Other recipes used a very thick custard. Others said to use a thin pastry cream. Since we were not filling the churros and didn't need the filling to be so thick, I opted for a pastry cream. I made pastry cream (CIA recipe - I only used 3 Tbsp of cornstarch based upon comments that the 1/3C of cornstarch made the pastry cream taste like ... cornstarch) for the churros early that morning. I made a quick thin chocolate dipping sauce while we were frying the churros. While you created food architecture, N and I fried the dough. 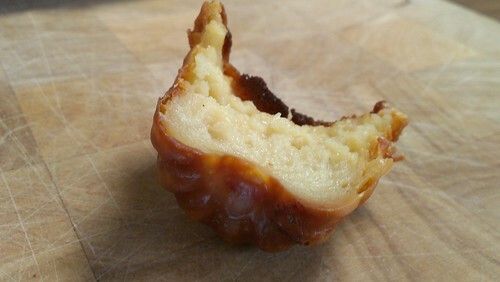 Next time we'll try a closed star tip instead to see if we can get more crunchy bits. I hope you had a lovely birthday, E! Thank you for celebrating it (belatedly) with us! I usually make something special for the new year but I did not this year. No hoppin' john, no sauerkraut, no cake, no pork. Maybe the cookies I made for Christmas can carry over to the new year. No? I guess Chinese New Year is coming up and I can ready my house for that. 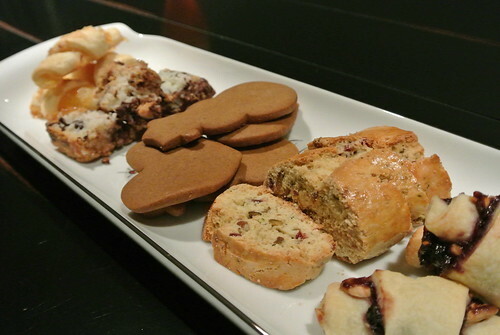 I made four types of Christmas cookies this year that we shared during our Pre-Christmas dinner. The usual 7 layer bars, aka magic cookie bars. A favorite of N's. Ginger molasses cookies, the type you roll out and ice. My favorite cookie, but I tried a different recipe this year and I didn't like it as much. Cranberry-Pistachio Biscotti, a last minute addition. I should have baked them longer the second time. Rugelach, two flavors. Bleuberry-marcona almond-white chocolate and orange-pineapple-coconut. The orange-pineapple-coconut ones were universally appreciated and I think my new favorite. I always use Lora Brody's dough recipe. For a festive drink to go along with our celebration, I made what the hibiscus jarring company calls a wild hibiscus royale -- muddle mint, remove from glass. 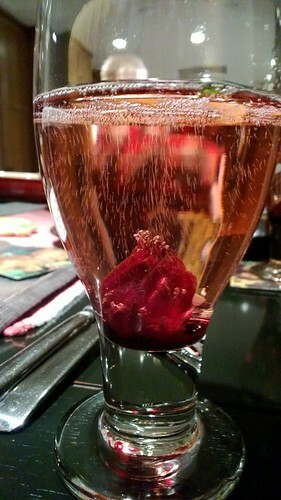 Put hibiscus flower in bottom. Add 1/2oz rose water. 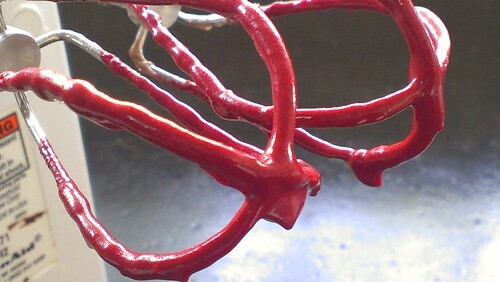 Add a bit of the hibiscus syrup. Top with champagne (I used a dry cava that had good reviews, Segura Viuda Brut Reserva). Add some more mint as garnish (which I didn't do). It was pretty! As a side, roasted brussels sprouts in a mushroom sauce was much tastier than I expected. 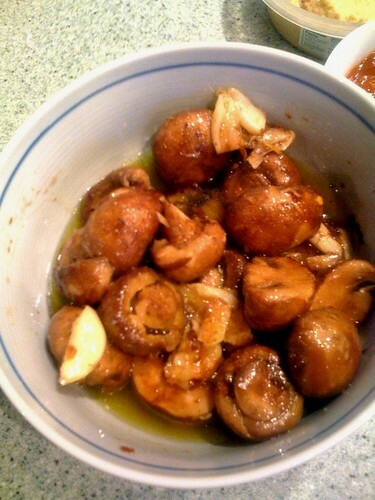 I guess you can't go wrong with mushroom sauce and roasted vegetables. Please excuse my tardiness thanks to this awful cold. Just over a week ago we got together to continue our celebration of G's birthday month with grilled meat and pie! N marinated some flank steak in Moroccan spices and grilled it along with some bell peppers and onions. Easy peasy, as Jamie Oliver would say! I made a quick harissa using this recipe. We really like this harissa with everything from fish to beef to chicken. I double the cumin and coriander and use 1-3 jalapeños depending on how spicy they are. Knowing that we had pie in our future, I opted to make two salads instead of anything too heavy. I threw together a quick raw carrot salad and an arugula-feta-mint-orange salad (inspired by this recipe). 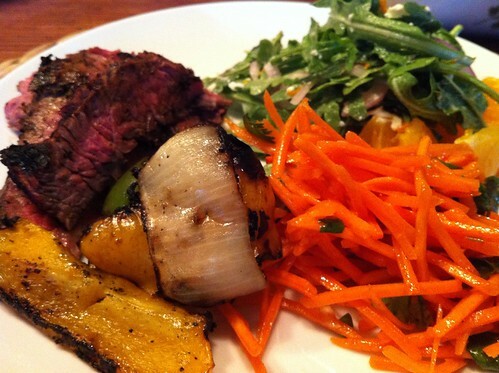 The carrots were a bit of a miss -- I thought they would go well with the flank steak, like do chua. Unfortunately they did not really work out that way. I liked the arugula salad (not sure about anyone else). I'm on a kick of adding mint to salad greens. Next time I hope to remember to supreme the oranges, though! You carefully carted G's birthday pie all the way up to our house without any major failure! 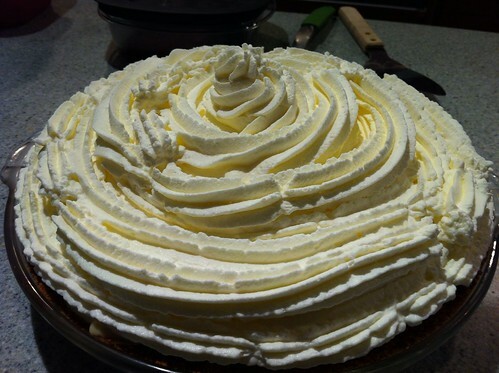 It was a banana cream pie (basic recipe), with addition of a 2 oz of white chocolate in custard and a salty caramel sauce. Yum! No games tonight due to super-full tummies. We have a few new ones to try, like the full version of Nuclear War (BGG). G, inspired by N's smoked salmon, immediately got some trout to make smoked trout (one of his favorite, who would have thought you can get trout here?!). While that experiment failed, this one worked out well. I present evidence below. 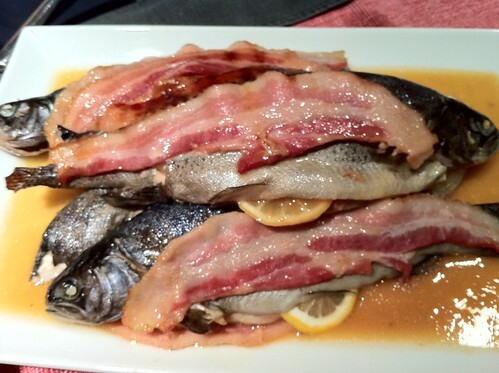 The fishes was brushed with maple syrup & brown sugar, seasoned with salt, stuffed with lemon and onions, layered with bacon, wrapped in aluminum and steamed on the grill. And he did it all by himself, by which, I mean, he found the trout, selected the recipe, prepped, and grilled/steamed. We won't mention how his helper always do the prep and finish - recipes, marinates, brines, sauces, plating, etc. The trouts separated from the aluminum foil nicely, minus the tails. 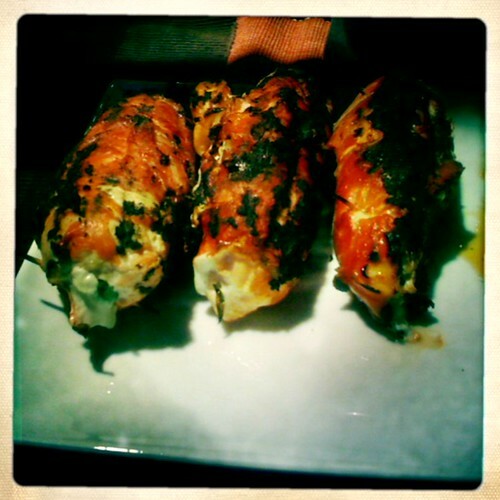 With no experience serving fish, I fumbled through it. N did a great job with his. Although the maple flavor was only on the skin, the fish was tasty. The fish was served with simple grilled yellow squash, zuc, and bell pepper, cucumber tomato salad, and couscous. For the salad, I chopped up some refrigerator pickled sweet peppers, onions & zuc, along with beefsteak tomato and English cucumber, tossed with parsley, lemon juice & zest, and a touch of olive oil. I seasoned the salad at the table with G's new fancy balsamic infused salt. N requested cilantro instead of parsley. Hmm. Does he always prefer cilantro? G, fished (pun intended), for compliments for most of the evening. So I am marking this occasion. Beers and meade later, we were allowed to move on, but we will come back to that. Last week, you and N introduced me to crème brûlée Imperial Milk Stout from southern tier brewing company. It is a yummy dessert beer. Is it also a good dessert? 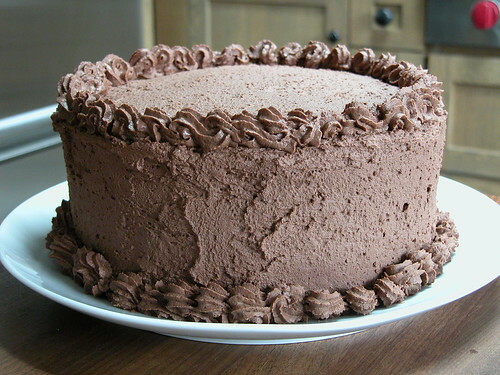 I chose Chocolate Stout Cake from epicurious over numerous other recipes due to the sour cream content. 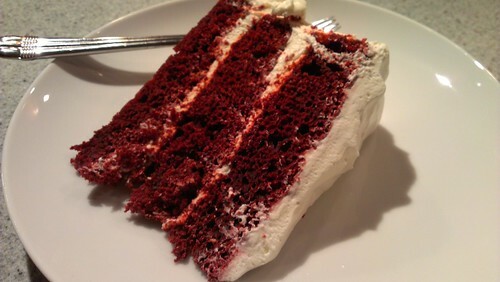 IMO, addition of sour cream improves the cake texture from good to yummy. I made the cake on Friday night and let the cakes cool over night. Saturday morning, I mixed up 3(?) cups of frosting for the layer and crumb coat. Let rest in the fridge for an hour. Then mixed up a few more cups for the final coat. For the frosting, I improvised a cream cheese frosting, instead of the ganache. 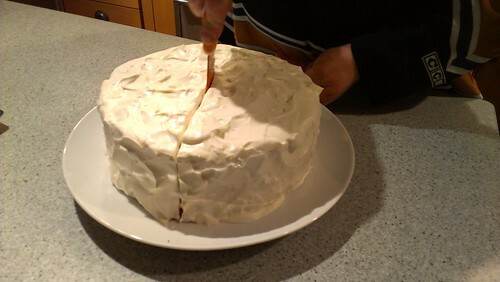 Previously, I followed a whipped cream frosting recipe, that makes a good looking, tasty, pipeable, stable frosting. I wanted to try a more chocolatey and denser frosting to go with this cake. So I increased the chocolate proportion ~12oz + 1 cups of cream cheese + 2 cups of cream. While tasty, it was not good looking. Also, there was an alchemy fail with the frosting. I was juggling the temperature of the various componets of the frosting. I melted the chocolate with a little cream, let cool a bit, then mixed with room temperature cream cheese. 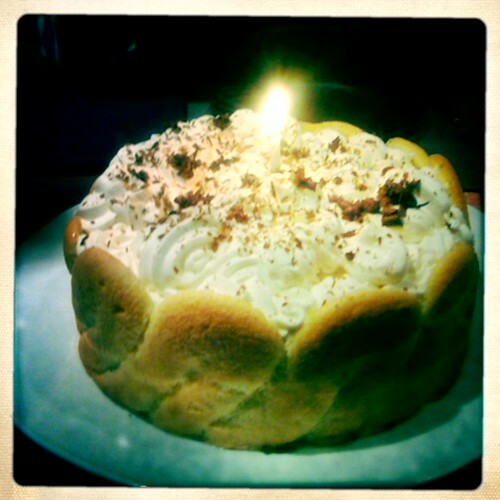 Separately, whipped the cold cream until soft peak, folded all together. Somehow, bits of chocolate appeared. I may try cocoa powder next time. 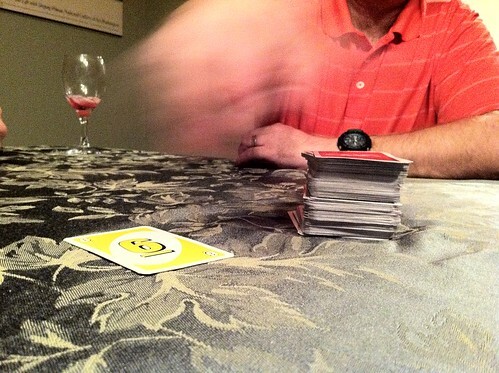 After over indulging, we played a round of Bohnanza. When we saw one card in the last draw, you wisely asked for a card count. Turns out my deck is missing a Wax Bean and a Blue Bean. Sad. I will put it on my list to replace. 'What did you think of that trout?" "That trout was pretty good." P.S. Thanks for the yummy beer and meade. I liked Avatar Jasmine IPA and Tricerahops Double IPA. I was sad I did not get any Ranger IPA. There is always next time. Thanks for another hobby! This time around, we had family in town -- two more adults and a kid! You contributed to the meal at the bookends -- drink, appetizer, and dessert. Yum! After a bit of a problem with the pitcher for the sangria, you adjusted it to taste and we all had a bit to relax... I could use some sangria right now, as a matter of fact. 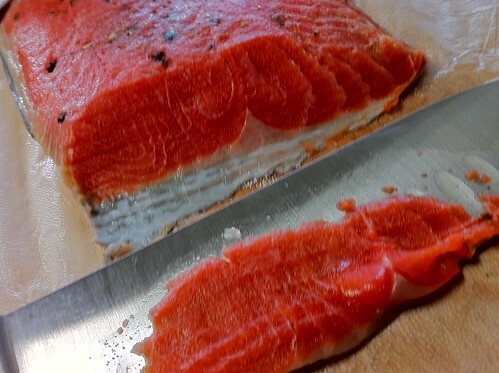 We started noshing on your gravlax, which was delicious. I am happy to know that it was easier to slice semi-frozen and it tasted as good out of the freezer as fresh cured (oxymoron?)! I am going to make some soon, I swear. For dinner, N made pork ribs (for K) and beef brisket (for his brother E). 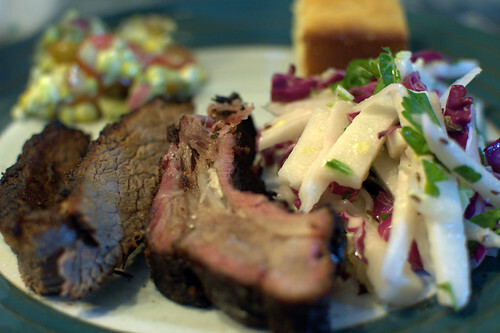 He changed up the brisket preparation and injected it with a mixture of beef broth and butter -- the butter in part because he accidentally trimmed off more of the fat than he meant to! It turned out well, I thought. The ribs were a usual N special. He used apple wood from your + G's tree to smoke them! 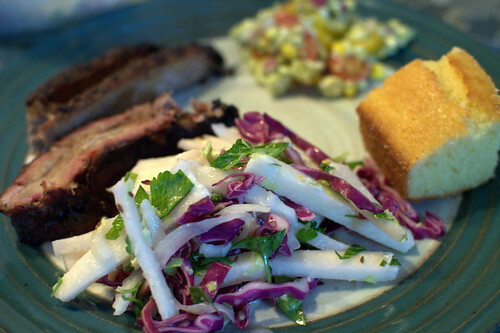 I was in charge of the cabbage slaw and N requested that I add jicama. I amazingly managed not to stab myself with the knife while julienning it. That success was tempered with me completely messed up the slaw dressing such that it ended up less punchy than I wanted. I forgot that I normally add both apple cider vinegar and a touch of plain ol' white vinegar to the dressing. That probably would have brightened it up a bit. I may try adding buttermilk next time around but we tend to go for a more vinegary than creamy dressing. I do like using both caraway and fennel seed in the dressing. I also threw together a super quick salad with a bunch of the vegetables in the house -- corn from the farm share, pear tomatoes, an avocado, lime juice, and tossed with a bit of cotija. It was nothing special. I also fixed my cornbread by buying fresh baking powder. That was my only change. It rose quite a lot and I liked it much better than the last few times I've made it (though a little sweet; I will cut back the sugar next time). The texture was what I wanted. Finally for dessert, you brought something specifically targeted to my niece N: strawberry shortcake! I'm not exaggerating when I tell you that N and E broke into the leftovers the following morning for breakfast. 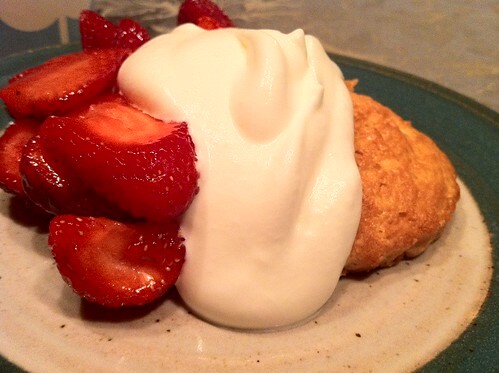 Strawberry shortcake for breakfast? Yes, please! They have both requested the biscuit recipe -- I believe you said it was this recipe at epicurious. 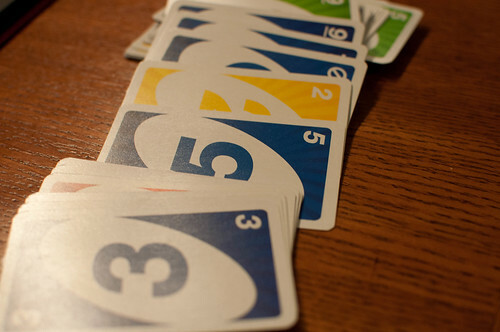 We finished the night with a few rounds of Uno and you won! Success! You have the cutest flower mugs! N causally mentioned cream puff a few weeks ago, and that idea has been stuck in my head ever since. Not that I think we need more to eat after the Cincy Style Chili. 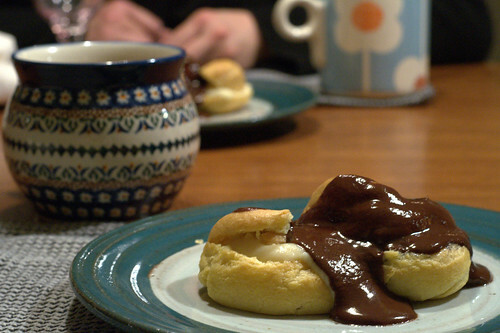 In the pass, I used pâte à choux recipe from Nick Malgieri's Chocolate: From Simple Cookies to Extravagant Showstoppers. 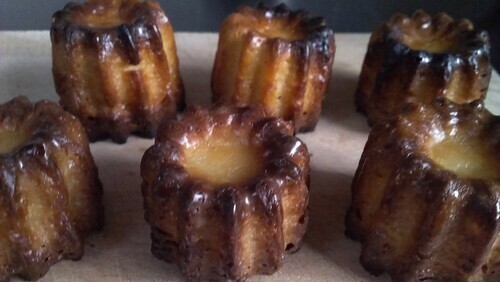 This time, I tried the Pierre Hermé recipe, which has milk (the Nick Malgieri recipe does not). I bombed the puffs - big ol fail. They fell down when they were cooling. So I went back to Nick Malgieri's recipe. I made the new-to-me chocolate glaze from Pierre Hermé's Chocolate Desserts by Pierre Herme ( available here ) and pastry cream from Rose Levy Beranbaum's The Pie and Pastry Bible to go with the puffs. 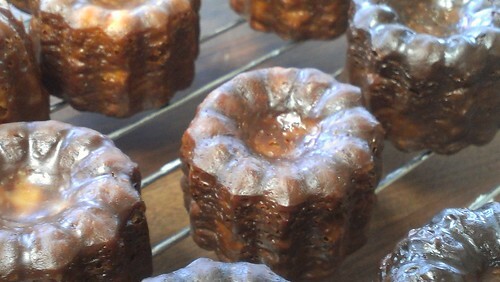 Mmm... can't go wrong when paired with coffee and flower mugs!